We are very pleased with Fantasi and Flinga, born in July 2018. While the heart wishes that we could keep both forever, the brain says that we can't give both a fair chance in the show ring or for breeding as we space our litters by 1-2 years. The decision had been made to keep Flinga, which means we are prepared to let Fantasi go to a new owner appreciating and capable to leverage on her qualities. 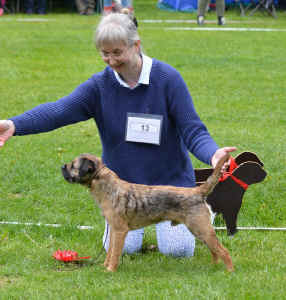 She is alert and willing to please as well as very well constructed; the photos are from the ring at her first show (BOB-puppy). Hereditary free of SLEM. Three out of the five F litter pups celebrated six months' "birthday" at the puppy show in Södertälje. 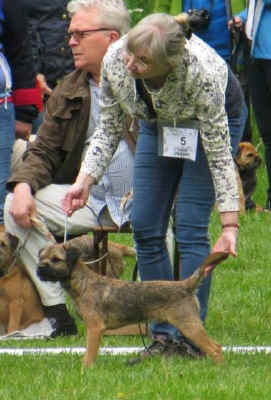 CC judge Cindy Pettersson made us very happy by super critiques, "hederspris" to all of them individually as well as in sibling class, awarding Fantasi BOB with her litter brother Fanfar as BOS. 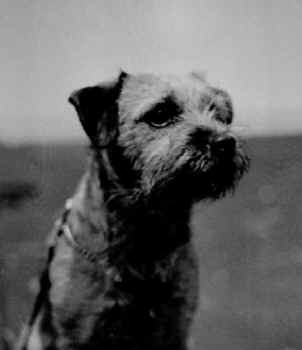 The sixth generation Sagimus Border Terriers is here! Athos class winner and 3d in the dog challenge at Årets Border - again! "Raggan", SE o FIN U CH Raggata (posthumously given the prefix Sagimus) was born in March 1978. 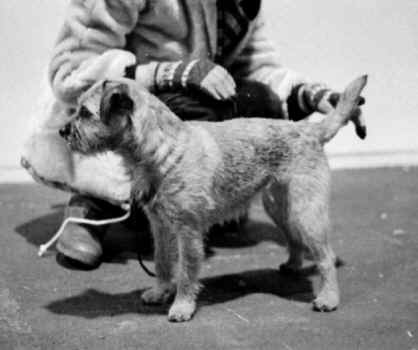 She was Åsa's teenage first shot at breeding, producing the Border Terrier type that we are still aiming for. Trixa was mated May 10th to "Freddy" SE DK NO LV U CH Snow Winds Just Between Friends, a lovely boy in type as well as temperament and well matched to Trixa. Both parents are DNA tested clear of SLEM.